iOS is one of the best and most advanced mobile operating systems out there, there can be no denying that. Personal preference about interface layout and design may take some people to alternative options such as Android, but even those can’t question the power of Apple’s iOS. However, no matter how good something is; there is always room for improvement, which is generally where the Cydia store comes in. Some of the most popular tweaks are those that allow users to quickly get access to a certain area of iOS or system settings, which is why Ron Melkhior’s Brightslide tweak that has just hit Cydia may prove to be quite popular. Brightslide may sound like a song by a popular American band, but it is in actual fact a small tweak that uses Ryan Petrich’s Activator, allowing jailbreakers to create an activation method that when invoked, produces a slider at the top of the device’s screen. The slider that appears on the top of the screen will look familiar and is just a newly rendered representation of the native brightness slider that can be found under ‘Settings >> Brightness’. The rest of the brightness functionality in Brightslide doesn’t really require any further explanation as it simply slides back and forth to increase or decrease the screen’s brightness. The right hand side of the overlaid view that appears at the top of the screen contains a small torch symbol which forms a tappable area and acts as a user facing button. We aren’t offering any prizes for what this button does, but for those who don’t want to put on their common sense caps, tapping the button activates or deactivates the rear LED flash to act as a flashlight. Brightslide doesn’t exactly provide earth-shattering functionality, but what it does bring is a quick and effective method to gain access to very specific settings that users may find useful. 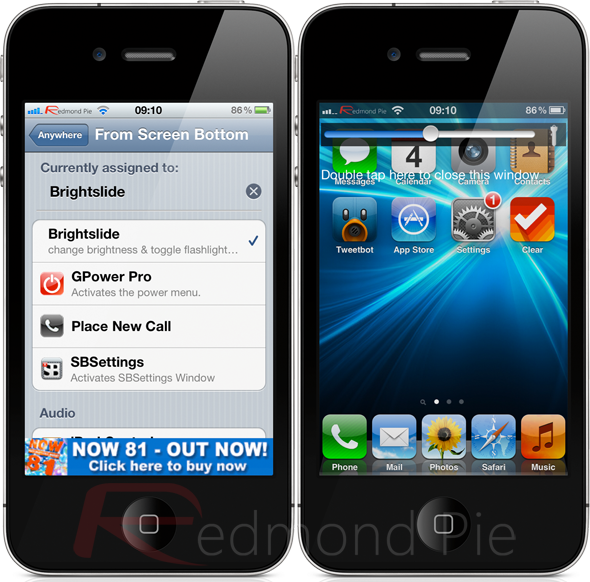 Brightslide is available from the BigBoss repository as a free of charge download with no specific mentions of iOS version requirements. Of course, you will need to jailbreak your device to install this tweak. For jailbreaking the latest iOS 5.1 (tethered), follow the instructions posted here to jailbreak using Redsn0w, or here for Sn0wbreeze. For jailbreaking iPhone 4S and iPad 2, you can simply follow our step by step tutorial posted here to jailbreak iOS 5.0.1 using Absinthe on Windows or Mac. Those of you with an iPhone 4, 3GS, iPad 1, and iPod touches can use Redsn0w or Sn0wbreeze to untether jailbreak on iOS 5.0.1.